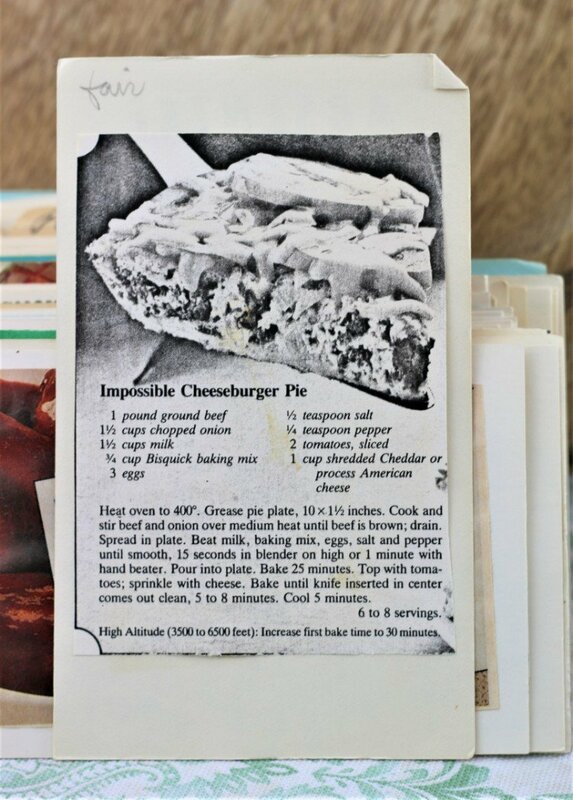 Front of the recipe card for Impossible Cheeseburger Pie. There are lots of fun recipes to read in the box this recipe for Impossible Cheeseburger Pie was with. Use the links below to view other recipes similar to this Impossible Cheeseburger Pie recipe. 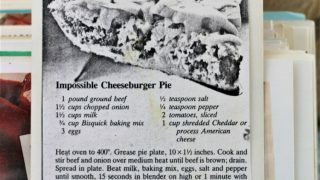 If you make this Impossible Cheeseburger Pie recipe, please share your photos and comments below! Grease pie plate 10x1½ inches. Cook and stir beef and onion over medium heat until beef is brown; drain. Beat milk, baking mix, eggs, salt and pepper until smooth. 15 seconds in blender on high or 1 minute with hand beater. Bake until knife inserted in center comes out clean, 5 to 8 minutes. High Altitude (3500 to 6500 feet): Increase first bake time to 30 minutes.